Image via AP. 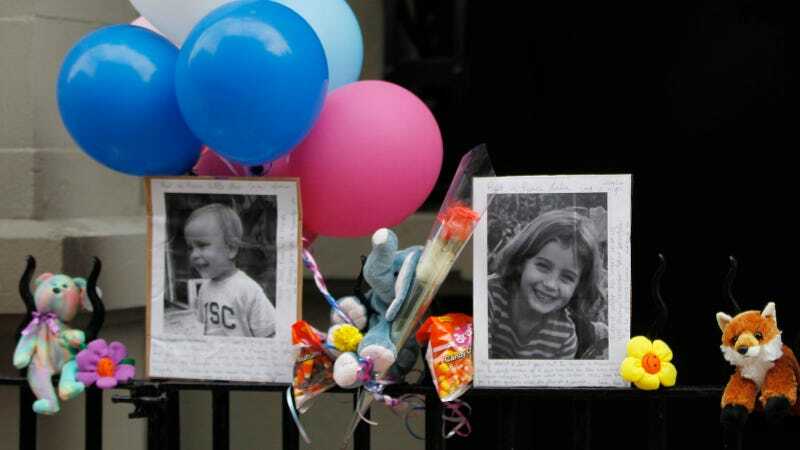 In this Oct. 27, 2012 file photo, photographs of six-year-old Lucia Krim and her 2-year-old brother, Leo, are displayed alongside balloons and stuffed animals at a memorial outside the apartment building were they lived in New York. On the third day of the trial of Yoselyn Ortega, the New York City nanny who killed two of her charges, the jury was instructed to inspect a photo of the bodies of Leo Krim, 2, and Lucia “Lulu” Krim, 6. As the picture was passed from person to person, a flash of red visible from the gallery, a juror’s lip began to wobble. She wiped her nose and pulled the neck of her sweater over her mouth, shaking her head. A woman beside her gently rubbed her arm. Five years in, this case has garnered significant media and tabloid attention; it has even inspired a novel. On paper, the trial gestures at a number of big questions, angles that a reporter might keep in mind as she attempts to parse what she sees. It inspires thoughts on class and privilege, about mental illness, even about “evil,” a word that’s come up on the witness stand several times. It’s difficult to think very hard about any of that, though, when you’re listening to a first responder describe what he found in Kevin and Marina Krim’s bathroom. Just a few days into a months-long ordeal, the brutality of the case sat heavy in the courtroom. For now, at least, it’s difficult to layer any concrete meaning atop such an anomaly, and one that still lacks a clear motive. Bubbling up under this case are the long-festering tensions that haunt an increasingly inequitable city﻿. Ortega, 55, is charged with two counts of first-degree murder and two counts of second-degree murder in the 2012 stabbing deaths of Leo and Lulu Krim. Though she admitted to the crime, she has pleaded not guilty by reason of insanity; the defense will attempt to prove that she did not plan the killings and did not understand right from wrong at the time. The prosecution argues the opposite—that Ortega “intentionally and savagely slaughtered” the Krim children out of resentment, and that there is no solid evidence of mental illness. The trial, which is expected to last for several months, will determine whether Ortega is sent to prison or to a mental institution (though in the state of New York, her chances of the latter are notably slim). On Monday morning, the chilly courtroom was slightly emptier than it had been the previous week. Two blonde law students sat in front of me, chatting quietly about an upcoming final as we waited for the day’s proceedings to begin. “I just saw red, I just saw red,” he repeated after a pause, visibly emotional. The court was shown photographs of the crime scene taken by Detective Bradley Gore, who was also called as a witness. One showed a bloody Ortega—who has since recovered from her injuries—lying on the ground; the other showed a large knife placed horizontally in the middle of a bloody sink, like a sundial. Sitting next to her lawyers, Ortega, who was wearing a gray long-sleeved shirt and a long ponytail, stared straight ahead. At the time of the killings, Ortega had been working for Marina and Kevin Krim, an affluent couple living on the Upper West Side, for two-and-a-half years on a part-time basis. The trial opened last week with the piercing testimony of Marina Krim, who described the experience of discovering the bodies of her two youngest children as a “nightmare that I knew wasn’t a nightmare.” The prosecution argued that Ortega waited to stab herself until Krim entered the room because she wanted to see her reaction. The defense, meanwhile, argued that Ortega had long suffered from mental illness and was “guarded” about it because she had negative impressions of mental health treatment, though she did seek help from a psychologist three days before the killings. In late 2012, two psychiatrists at NewYork-Presbyterian/Weill Cornell hospital found that Ortega had “major depressive disorder with psychotic features.” Mental health experts are expected to testify at length for both the defense and prosecution. Bubbling up under this case are the long-festering tensions that haunt an increasingly inequitable city. When viewed from an arm’s length, elements of Krim’s testimony pointed to the many ways differing backgrounds can put us at odds. In statements that Justice Carro ordered thrown out, on the grounds that they were collected by the prosecution while Ortega was still delirious and without representation, Ortega complained to police officers about the extra hours of cleaning work Marina Krim had asked of her. She also said that the cleaning products she used hurt her skin, and expressed anger at the Krims for her financial situation. Arguments from both sides alluded to class issues in particular, with the defense highlighting several of Ortega’s apparent workplace grievances—grievances that could register as legitimate, if this weren’t a murder trial. As it is, faced with a crying superintendent, one has to briefly wonder whether there is very much to find here, really, other than pain.